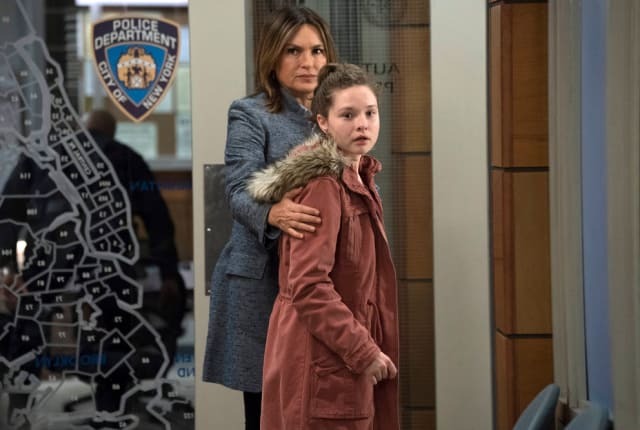 On Law & Order: SVU Season 20 Episode 13, there is more to the story than meets the eye when a teenage girl confesses to killing her father. Law & Order: SVU Season 20 revolves around the story of two teenage sisters who are orphaned when their father is killed. At first, the girls claim that their father was stabbed by a masked intruder with a knife, but when forensic evidence shows that this isn't possible, Britney admits that she stabbed her father herself. However, she claims she had no choice because he was sexually abusing her sister. The girls tell a harrowing tale of abuse and Stone has no interest in charging them as adults. However, soon Laura says that she told their neighbor Greg what happened. Greg denies knowing anything about the abuse and says he can't believe it. He is appointed guardian of the girls thanks to a deed the father left behind and won't let them answer any more questions. Fin quickly proves that the document is a fake, but Stone can't get a conviction on the kidnapping charge against Greg unless the girls testify, which they won't do. While questioning Greg's girlfriend, Carisi finds a copy of Romeo and Juliet that Greg gave Laura. Benson talks to Laura, who insists she's an adult and says she and Greg are engaged. Meanwhile, when Rollins goes into labor, Dr. Al shows up and proposes to her as well, while Rollins seems to be more interested in Carisi. To find out what happens, watch Law & Order: SVU Season 20 Episode 13 online. Leah: You have to help my little sister. Benson: We will. The ambulance is going to take you to the hospital as soon as it gets here, okay? Laura: I just want to go home and be with my daddy. Leah: Daddy's dead. Tell her. Permalink: Daddy's dead. Tell her. Cop: They have to see their father's dead body. You deal with kids like this all the time. I don't know how you do it. Carisi: Sometimes, neither do I.
Permalink: Sometimes, neither do I.